Timing is important when it comes to scheduling a college career fair. Doing it at the wrong time of year will ensure you get few attendees and even fewer recruiters. Since it's likely you don't have the budget to hold countless career fairs throughout the year, you need to schedule your career fair carefully. Think about a typical college semester. The students arrive and get settled into the dorms before the first day of class. The first week is spent finding new classrooms, meeting their professors and getting into the groove of school. The first-month students are immersed in new subjects and taking their first tests. They may be pledging to Greek life or joining clubs and meeting new people. Then, for a couple of months, it becomes a pattern of going to class, studying and taking tests, with social activities in between. Towards the last weeks of schools, finals are looming which can mean studying hard and focusing on little else. What part of the semester do you think is ideal for scheduling a college career fair? If you said the months in the middle, you are correct. Those are the months where students are not overwhelmed by the start of a new semester and not under pressure to pass finals. It is an ideal time for students to attend a career fair. Another piece you must consider in scheduling a career fair is when recruiters are going to be available. Most recruiters travel to multiple schools throughout the semester, with most of that travel taking place in those two middle months of the semester. You want to schedule your fair at a time when you are likely to get the most recruiters. 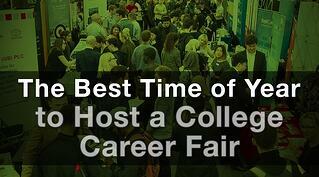 When is the Best Time of the Year to Host a College Career Fair? From a student's perspective, the best months of the year to schedule a career fair are February, March, September, and October. However, recruiters are going to be busy during those months. How do you strike a balance between your students and your recruiters? Career fair experts recommend scheduling your job fair earlier in the semester rather than later. The earlier weeks in the semester tend to be less schedule heavy for recruiters. That brings us to early to mid-September for a Fall career fair and late January to early February for the Spring semester fair. Another option is to go later as recruiters often have positions they have not filled. That gives students a prime opportunity to grab a recruiter's attention and hopefully land an interview. No matter when you decide to schedule your career fair, the key is to get on the recruiter's calendar as early as possible. That way, even if you decide to have the event during the busiest part of the semester, you will already have your recruiters lined up. We suggest sending out the invitations at least 4 to 6 months prior to the career fair date. Hopefully, this will help you with scheduling your next job fair. You are the one who knows when your students are in the best position to attend the event. Ultimately, you are the one to decide when the college career fair gets scheduled.